Yesterday I told you about looking for elephants in Africa and the overwhelming need for conservation; with rhino the situation is even more desperate. In fact the last time I was in Africa, in the Serengeti, I didn’t see any at all. The population has declined by a whopping 97.6% since 1960, fuelled by the demand from the Chinese medicine market and Asia, and that is, frankly, disgusting. Our first ‘almost’ sighting of rhino in Arica came in the Ngorongoro crater, where our guide spotted a white rhino way, way in the distance (if you’re going on safari then binoulars are an absolute must). Too far to see with the naked eye, or even take a photo; but it felt comforting to know that there was at least one rhino within driving distance. 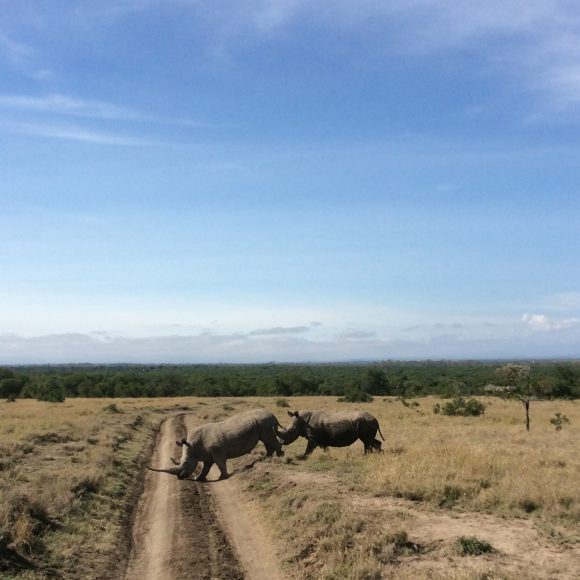 We were more successful in the Ol Pejeta conservancy in Kenya, where we glimpsed our first rhino in the bushes – black rhino, two of them. They are so bizarre-looking, prehistoric, and just beautiful. Our next sighting came shortly after, when we saw a mother and baby crossing the road, and then grazing. It was just fascinating to watch them. They are so vulnerable, all you want to do is protect them. And then on our final evening in the Masai Mara we were taken on a special trip; we got out of the jeep and were led to a clearing, and there was an enormous white rhinoceros (and white doesn’t really mean white, they’re a light brown). We all stood in silence watching this magnificent creature as it ate, and to be so close to one of the world’s most endangered species was an extraordinary feeling, knowing how precious they are. She was joined by another rhino, and we learned their names are Queen Elizabeth and Kofi Annan. They are guarded 24 hours a day by 10 rangers; there was another one but it was killed by poachers last year – tipped off by one of the rangers who were supposed to be protecting it. 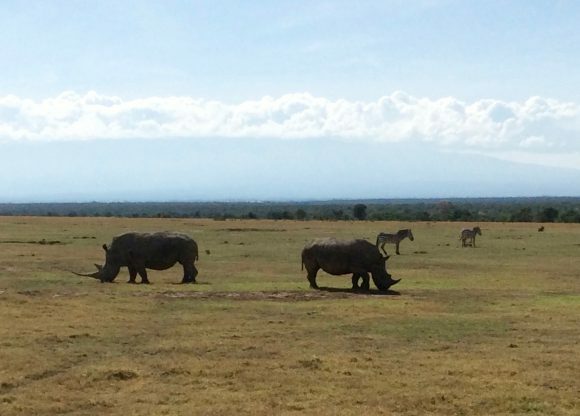 Seeing rhino in Kenya was incredibly special; knowing that they could be completely extinct in 10 years is tragic.